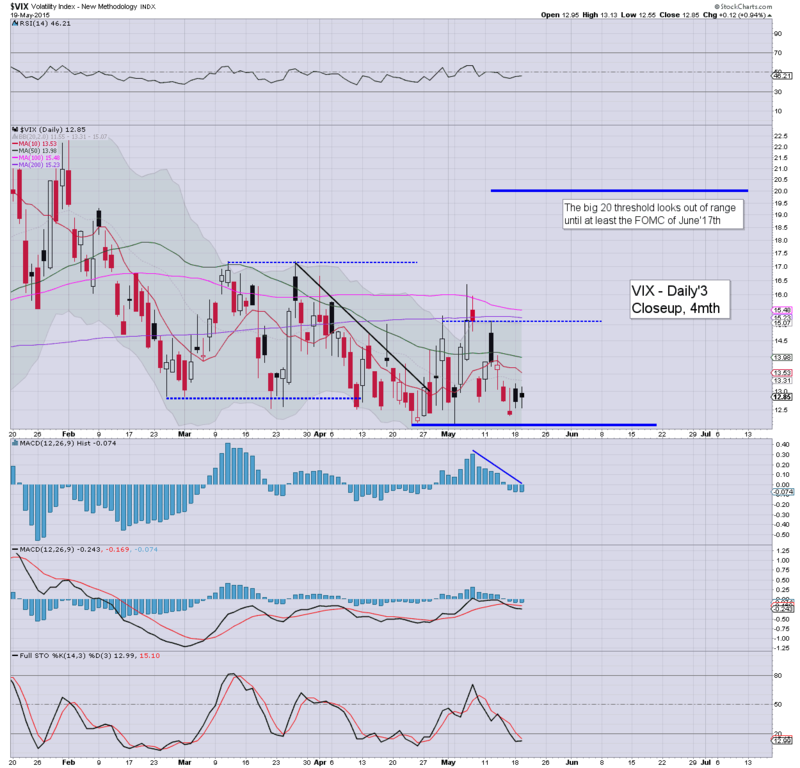 With the equity market cooling in the late afternoon, the VIX clawed back to positive, settling +0.9% @ 12.85. 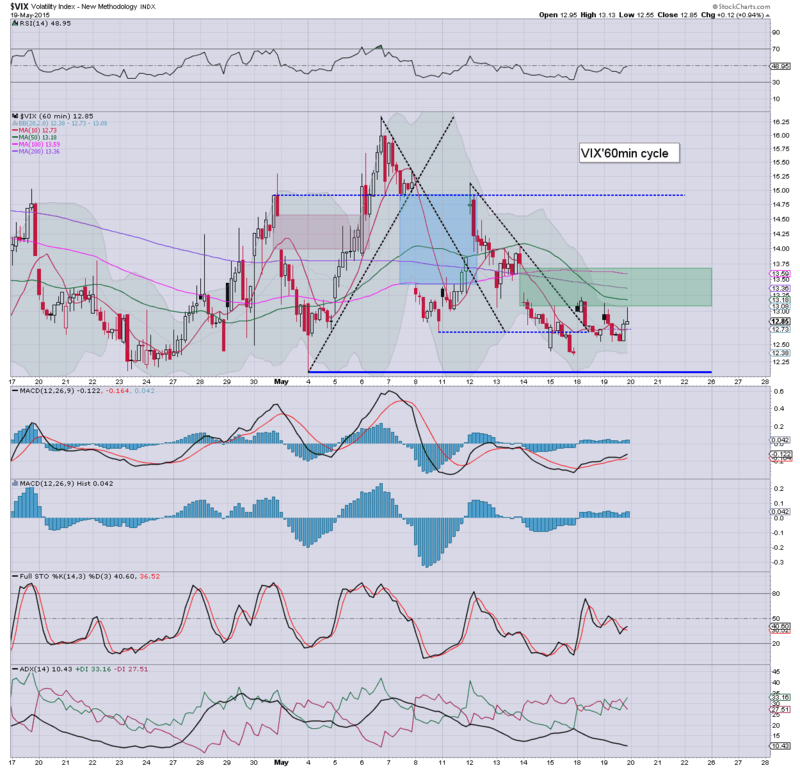 Near term outlook offers continued upside into the next FOMC of June 17th, which should equate to VIX remaining within the 15/11 zone. *with a touch of equity weakness in the late afternoon, the VIX turned positive, but still... 1% of the 12s remains a very low VIX. Suffice to say... market volatility remains very low. 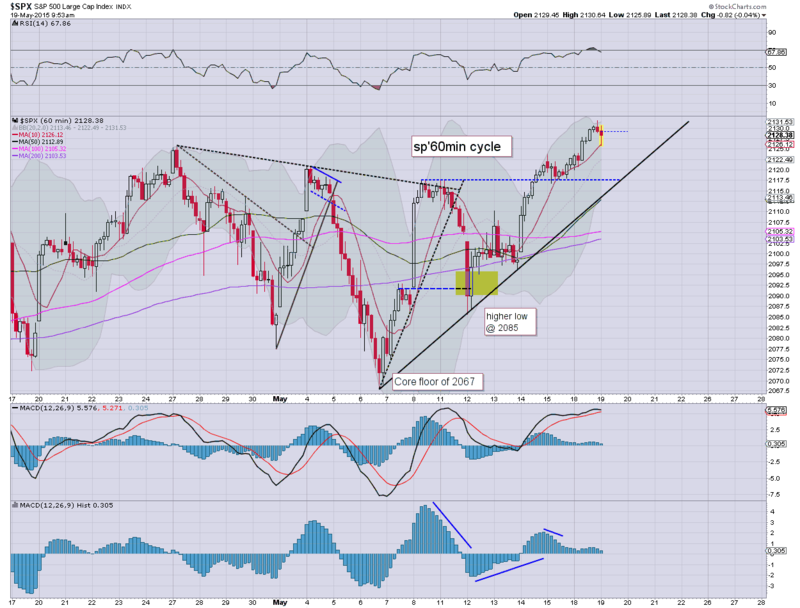 The big 20 threshold looks out of range until at least the next FOMC of June 17th. US equity indexes closed moderately mixed, sp -1pt @ 2127 (intra high 2133). The two leaders - Trans/R2K, settled lower by -0.8% and -0.1% respectively. 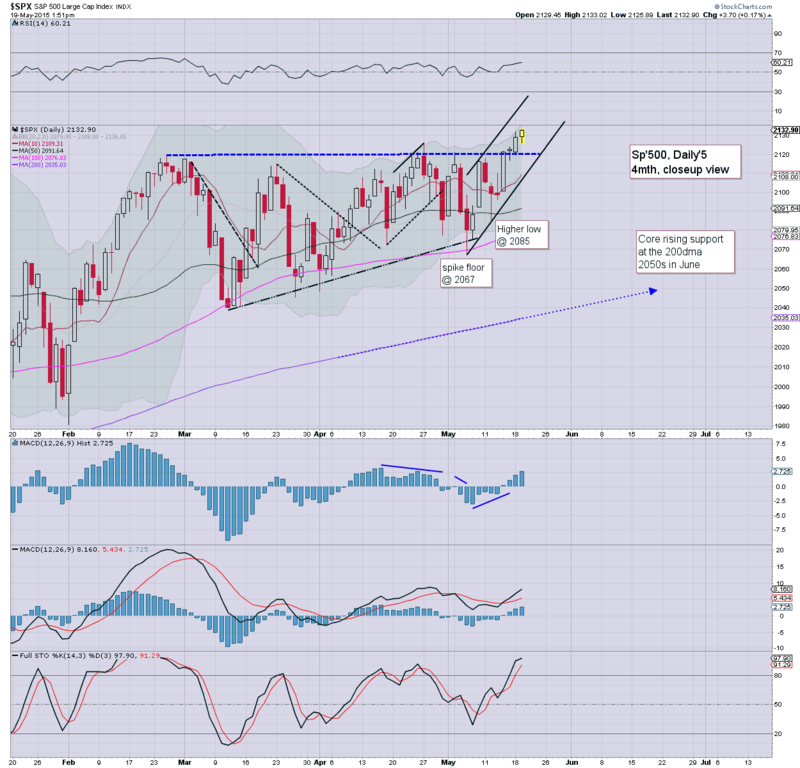 Near term outlook remains bullish into the next FOMC of June 17th... at which point the sp'2170s will be viable. 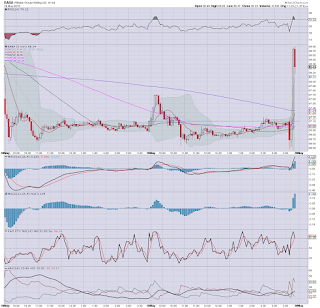 I'm not yet aware of the reason why, but that sure was a big closing hyper-ramp. 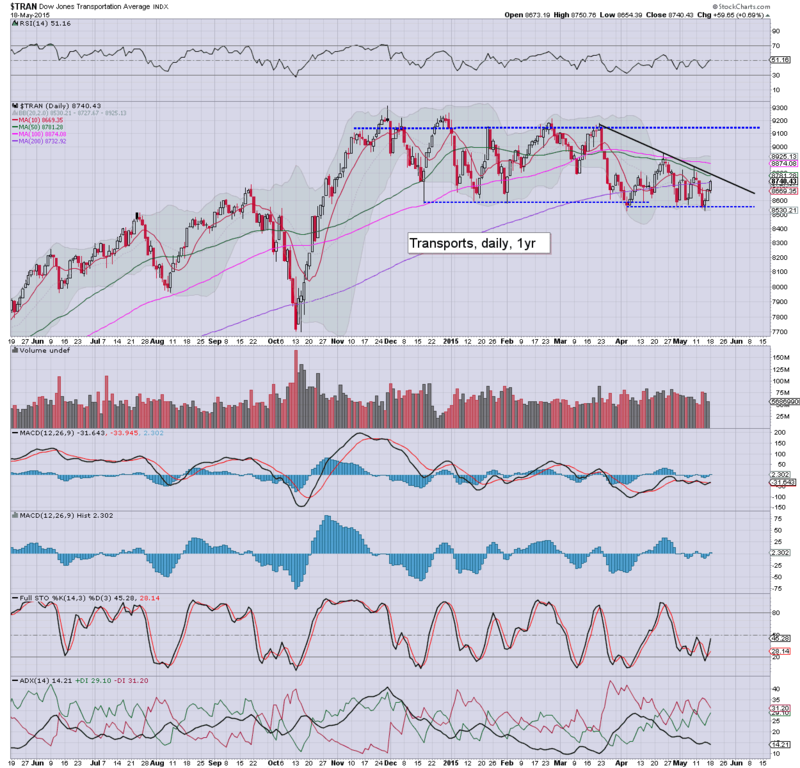 As for the broader market... it remains bullish... but with notable weakness in the Transports. 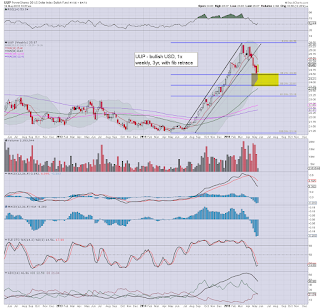 *I remain short Gold via GLD (currently underwater from the 114s)... seeking an exit in the 113s before the weekend. 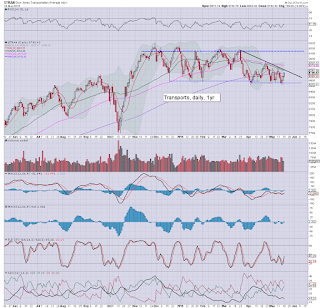 Whilst the broader market minor gains have flipped to fractionally negative in most indexes, the standout laggard remains the Transports, -0.7% in the 8600s. 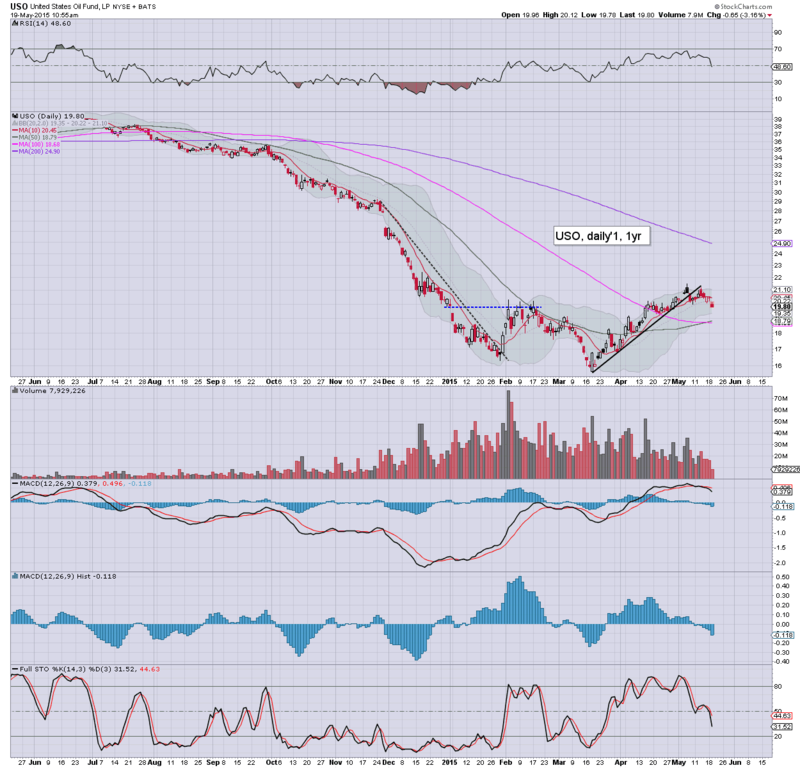 The current declines are especially notable as Oil is lower by a very significant -4.0%. *With the USD set to close with sig' net gains for a second day, both the metals and Oil are set to close significantly lower. As for the Transports.. it IS a very important index to watch. Best guess.... the Trans to break UP.. >8800... but clearly.. if that is not the case.. and the Trans goes much below 8500... it'll be suggestive of broader market weakness. 3.16pm... first soft support 2120/18 or so. 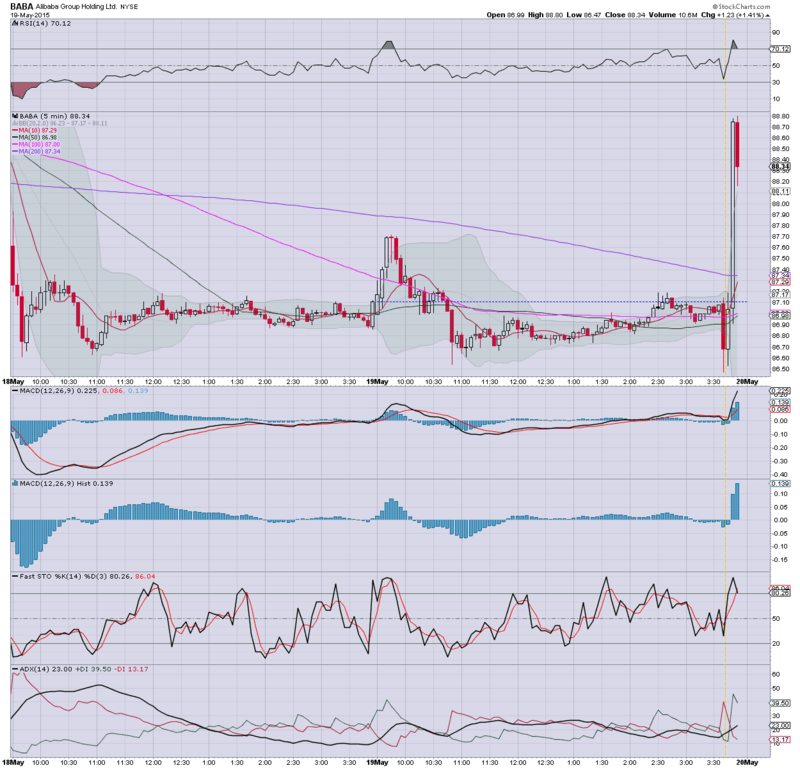 Ironic that two consecutive red hourly candles merits a mention. sp' -3pts 2125.... its all minor so far. Equities have slipped into algo-bot melt mode, with new historic highs in the Dow and sp'500. 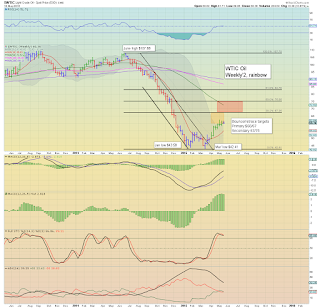 Despite lower oil, Transports remain notably weak, -0.4%.. stuck under declining resistance of 8800. Metals remain weak, -$16, with Silver -3.1%. 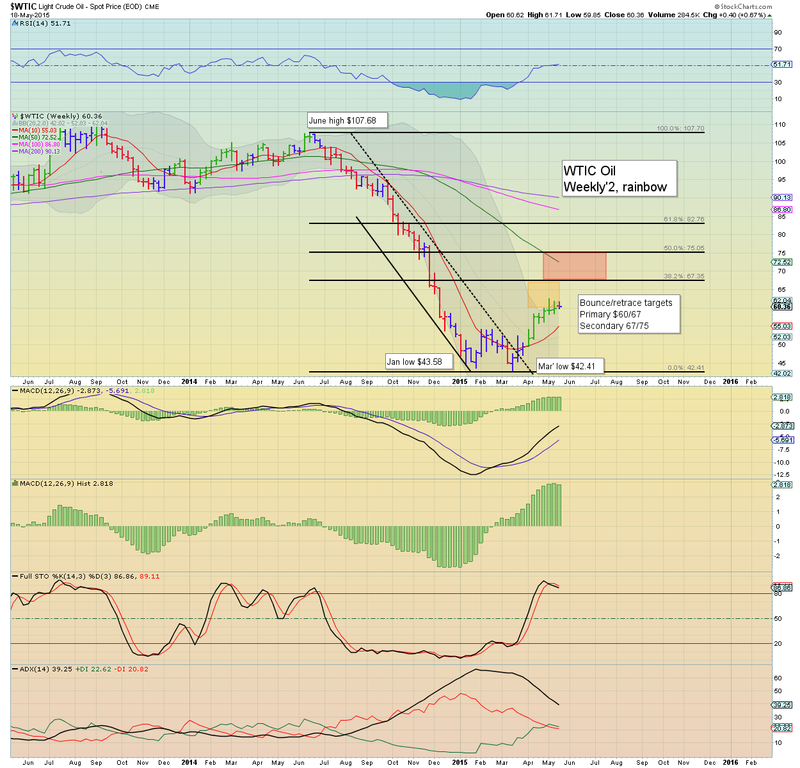 WTIC Oil is under USD pressure, -3.9% in the $58s. 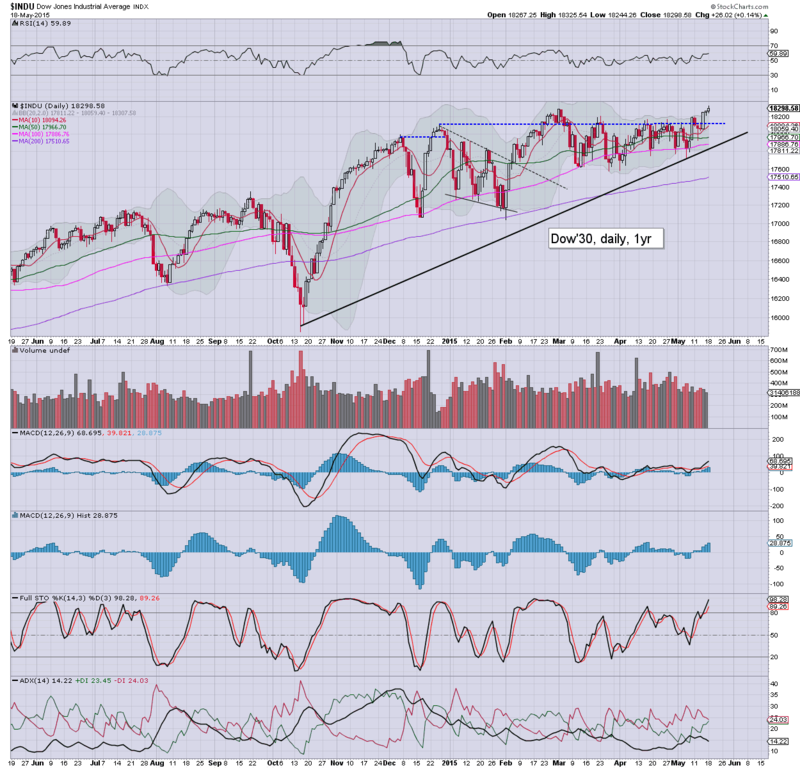 Hmm... so.. new highs, but the 'old leader' is certainly not reflecting it.. and remains firmly stuck. However, lets be clear.. if we see Trans breaking into the 8800s later this week, it'd indirectly suggest sp'2170s are due in mid June. notable weakness, GDX -3.1%.. as the metals remain significantly weak. 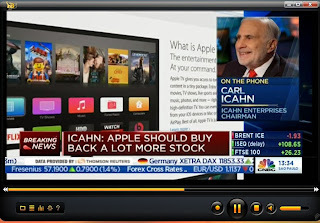 Whilst the broader US equity market is seemingly content to remain in chop mode - close to historic highs, the infamous Icahn is on clown finance TV, again touting AAPL as under-valued. Meanwhile, USD is holding sig' gains for a second day, +1.2% in the DXY 95.30s. 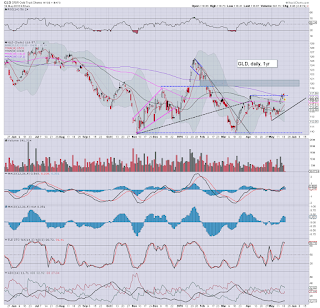 *I will have eyes on UUP as a way to be long the USD... but not at this price.. nor time. I am seeking a renewed wave lower in June/July to 24.00/23.80s. From there, I will be seeking 30/31. Little to add on the broader market. 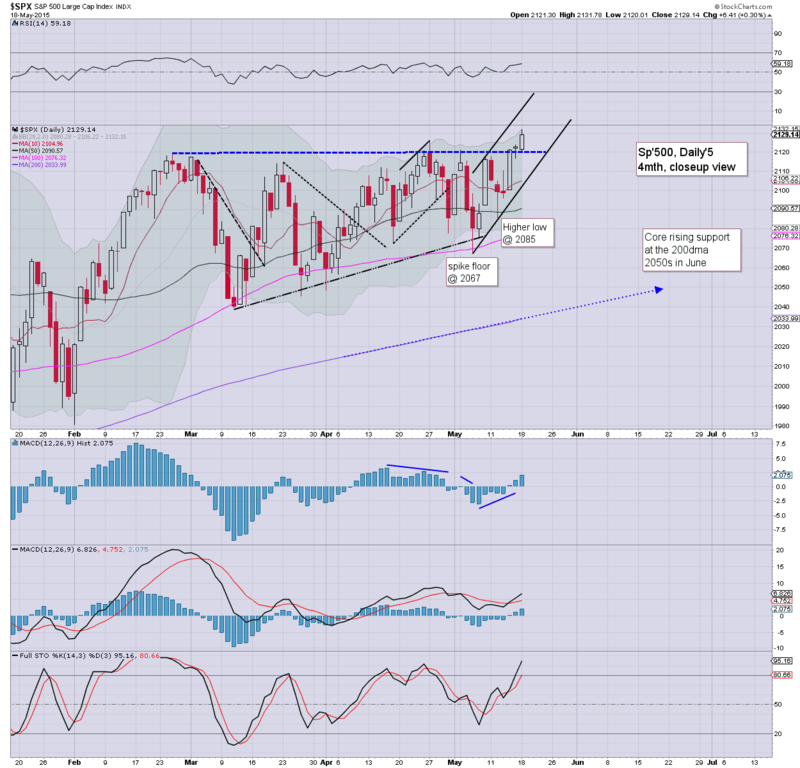 There is NO downside power... and market is arguably just waiting for the next excuse to push into the sp'2140s. As for Icahn... I wonder if he has a schedule on his wall at home, on the frequency for him to re-pump certain stocks. I can't blame him... and I do agree with him entirely on AAPL. The valuation of $130s makes no sense, relative to the broader market. notable weakness: Copper miners, FXC/TCK, both lower by -4%.. as metals are under pressure via stronger USD. Well.. its another rather quiet day in equity land. 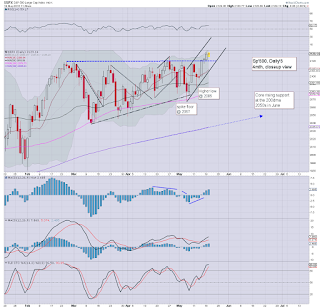 It seems Mr Market is just waiting for the next excuse to rally into the sp'2140/50s. I would remind anyone of the FOMC minutes.. due tomorrow at 3pm. USD looks set to hold sig' gains for a second day.. and that should keep the pressure on Oil and the metals into tomorrow.. if not into end month. 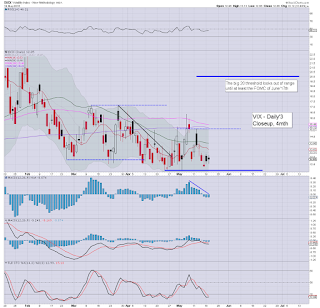 Whilst equities continue to see minor chop in the sp'2130/25 zone, the real action is in commodities. With the USD +1.2% in the DXY 95.30s, metals and Oil are under rather strong downward pressure, Gold -$17, with Oil -3.2%. Gold and Oil are clearly rolling over... and should see at least some degree of further downside across the next few days. To be clear though, I do NOT believe the USD has seen a key floor from the March high of DXY 100.71. 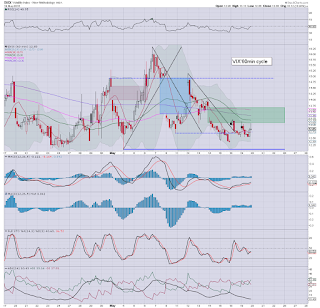 It would seem the secondary target of DXY 90/89 looks likely to be hit this summer.. before a key turn... and then the hyper-ramp to the 120s. More than anything, what should remain clear.. there is no sig' downside power. The broader weekly/monthly cycles are both offering the sp'2170s by mid June. I see a fair few getting overly excited about possible downside, but it seems pointless, as many are lost in the minor noise... with no appreciation of the bigger picture. re: metals. Considering the USD, metals are still holding up rather well. 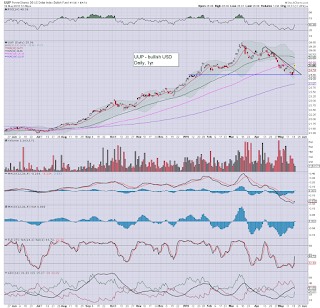 Daily MACD cycle is clearly starting to rollover. 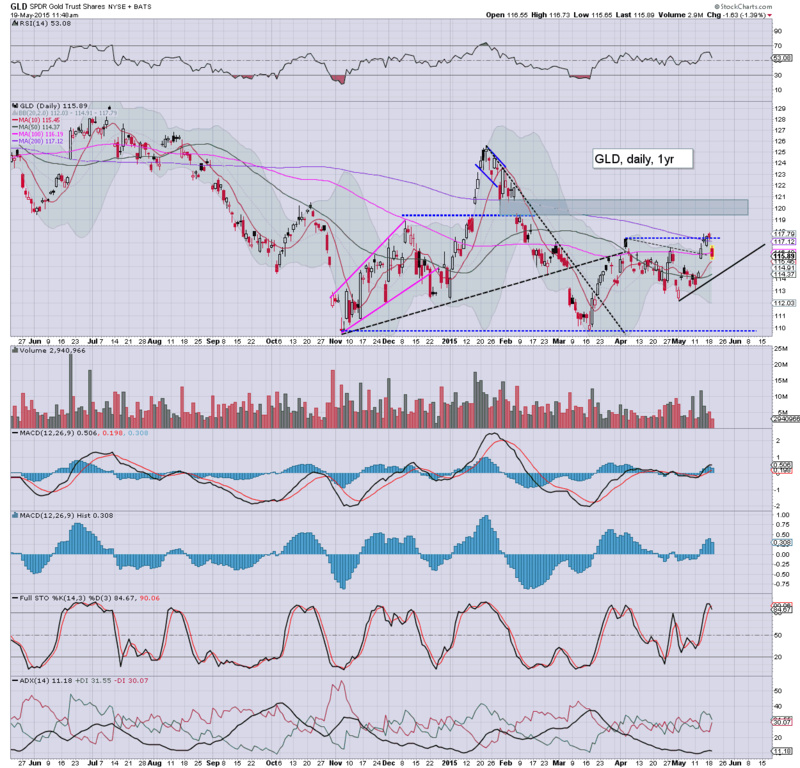 First downside target is the 50dma in the GLD 114s... breaking under that will not be easy. 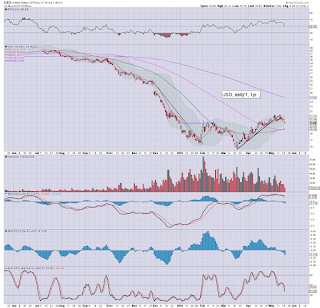 notable weakness: oil/gas drillers, RIG -3.9%, SDRL -5.2%.. as oil prices decline. Good morning. Futures are moderately higher, sp +5pts, we're set to open at a new historic high of 2134. USD continues to rally, +0.8% in the DXY 95.00s. 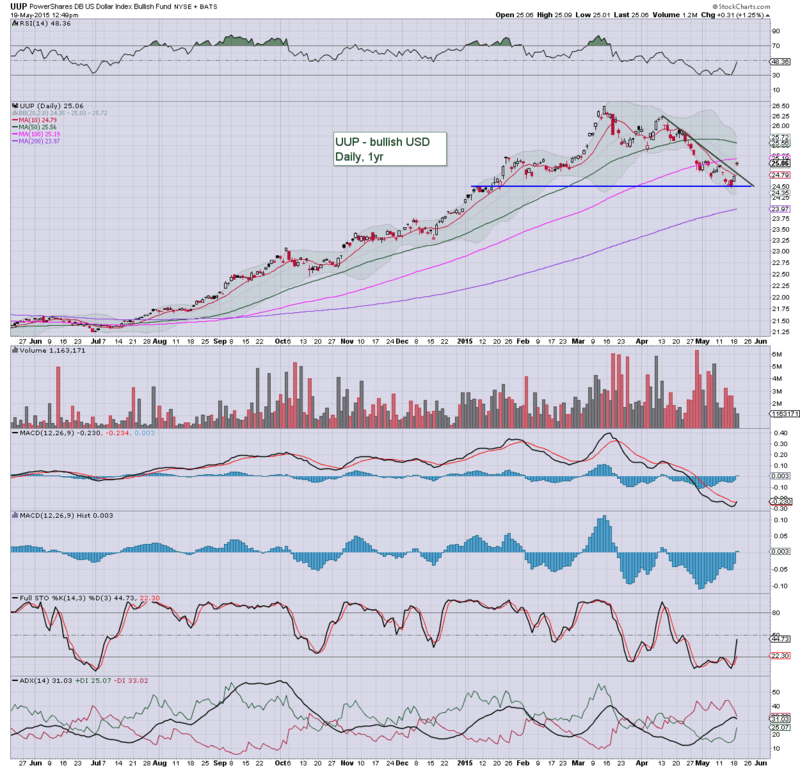 Metals are under pressure, Gold -$4. Oil is similarly on the slide. -1.8%. 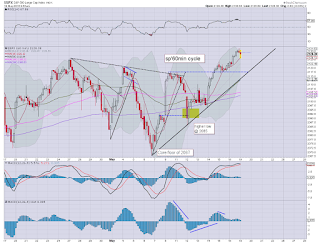 *Seen on the weekly cycle, we can clearly see a provisional sign of weakness for WTIC Oil, via a blue candle. A retrace to the 10MA of $55 looks due. So... another day for the equity bulls looks due. There is little reason why we won't just keep grinding higher. 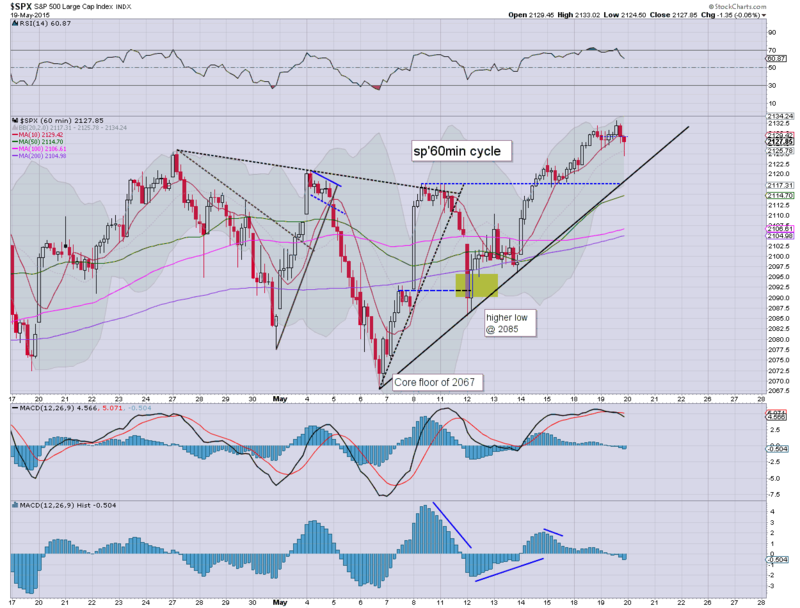 First target remains the upper boll' on the weekly cycle... currently in the 2150s, but that will be in the 2160s by end month. Further.. by the next FOMC of June 17th, the 2170/80s will be viable. That might make for a mid term top. 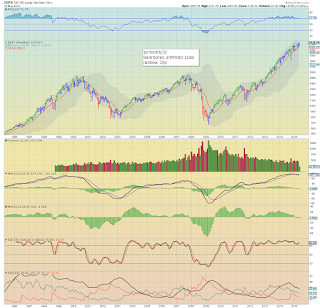 However.... as I will keep highlighting, if the Nasdaq can break >5132... it will bode for the 5200s, and if we see a monthly close in the 5200s, it will likely not stop there. RIG/SDRL, both lower by around -2.5%.. as Oil falls. 8.43am.. Housing starts data came in rather good.. 1.135 million... first bit of reasonable econ-data in what seems like months. 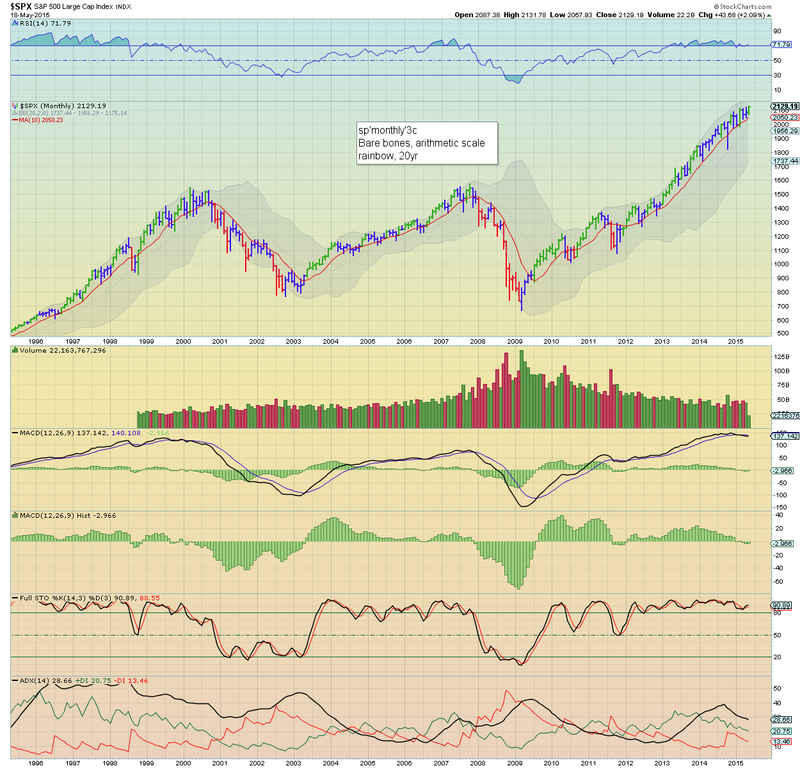 The Nasdaq composite saw a net daily gain of 30pts @ 5078, a mere 54pts (1.1%) shy of the March' 2000 high of 5132. 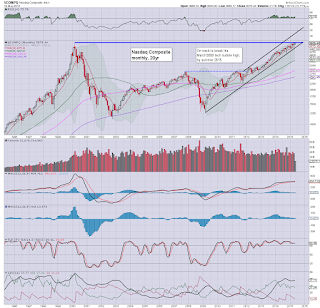 A monthly close in the 5200s (whether June, July, or August) would bode for further upside of another 300/500pts to the 5500/700s, before the next realistic chance of a sig' correction. 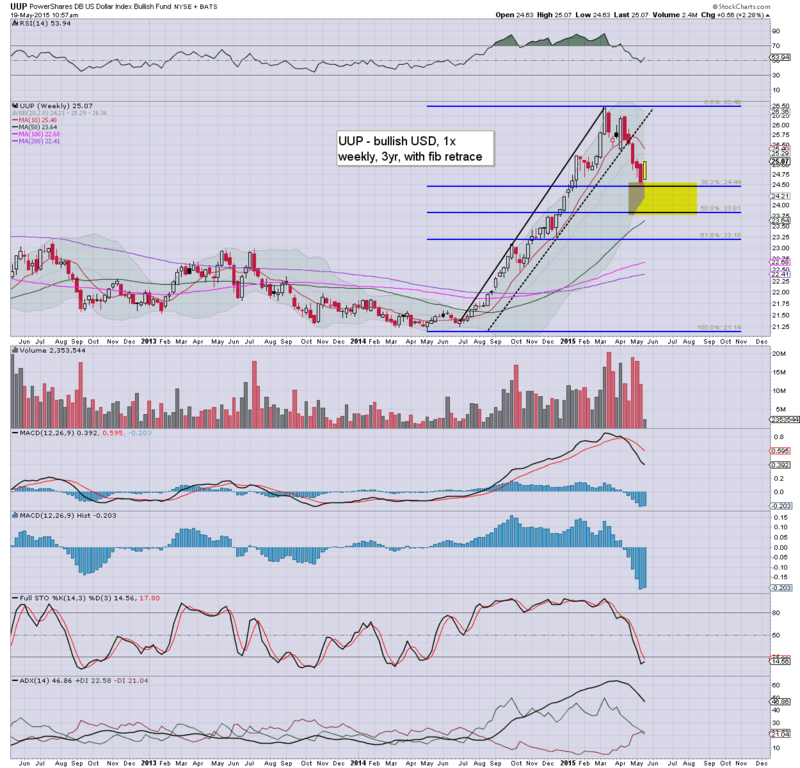 *I do like to use chart 3c from time to time, if only to highlight just how crazy powerful the current rally is. 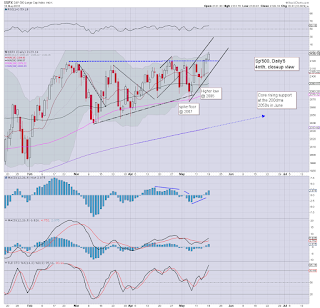 As for the tech', it does look like the Nasdaq comp' will break above 5132 in the near term. 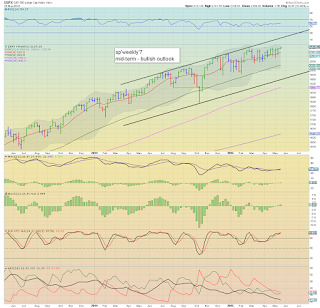 Far more important though (at least to me).. a monthly close in the 5200s should clarify there will be NO correction in the broader market until the Nasdaq can build up at least 10% of buffer room. It is HIGHLY arguable that 5K is now solidifying as a concrete floor. The implications are huge... but I won't go over that right now.. I've covered that issue many times in the past few months. Tuesday will see housing starts data. 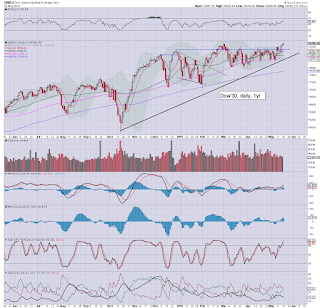 US equity indexes closed moderately higher for the third consecutive day, sp +6pts @ 2129 (intra high 2131). The two leaders - Trans/R2K, settled higher by 0.7% and 1.1% respectively. 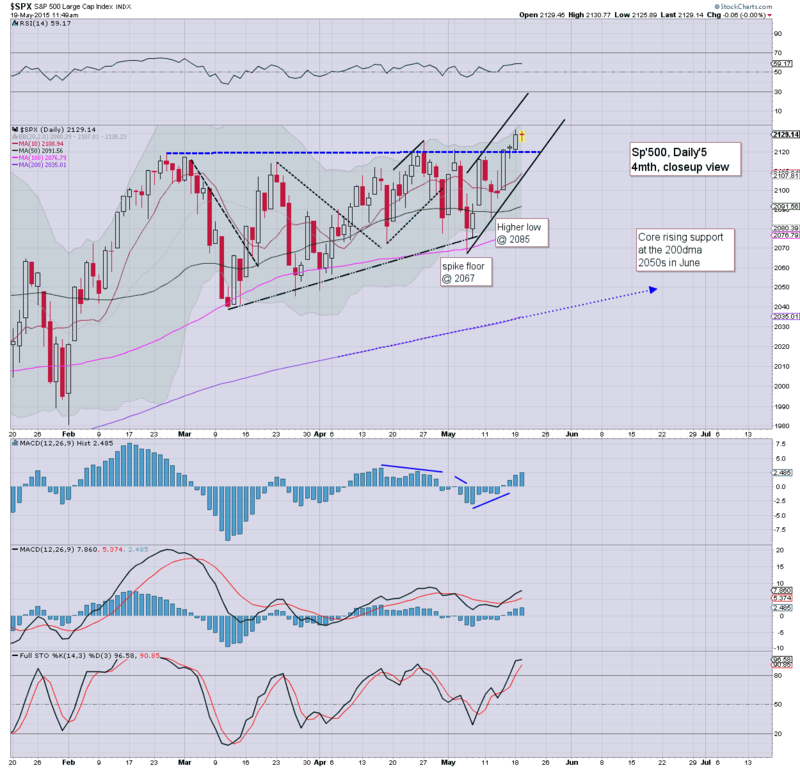 Near term outlook is for continued equity upside to the sp'2170s by the FOMC of mid June. 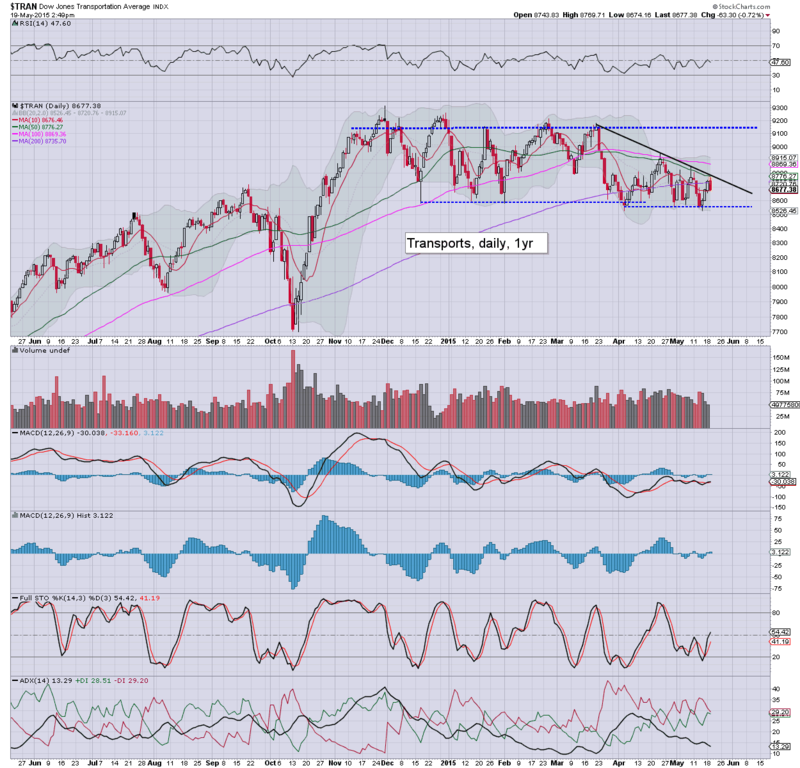 *Trans remains a clear laggard, but a break above 8800s looks viable later this week. 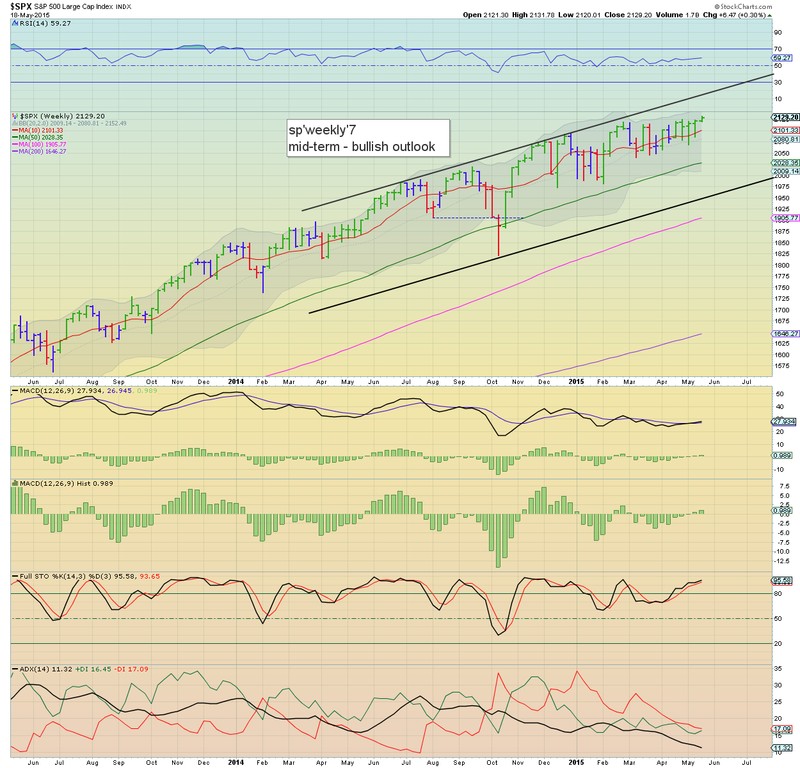 If that is achieved, new historic highs are viable by mid June. A third day for the bulls, and in addition to the two new highs in the headline indexes (Dow/Sp'500), even the two leaders showed a litlte upside kick. 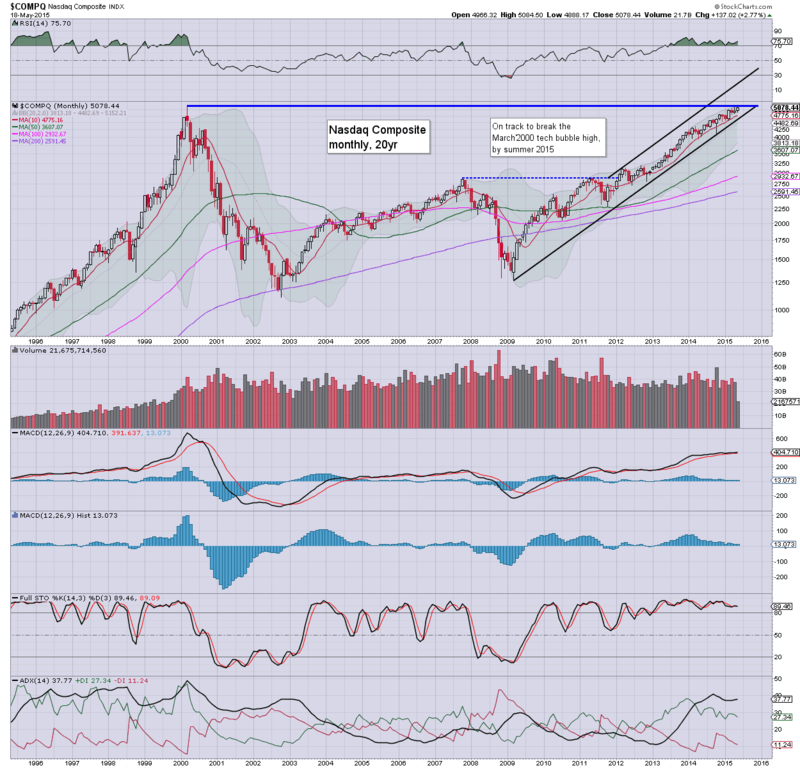 Nasdaq comp' looks set to break the March 2000 bubble high of 5132.. and if that is the case, it bodes for further upside across much of the summer.